From the side view, he looks an inch or two shorter than the golfing colossus you fondly recall bestriding the fairways of Royal Dublin and Portmarnock 30 years ago. But when Javier Ballesteros turns around the jet-black hair and facial features instantly tell you that you have located him among the plethora of pros bashing balls at Galgorm Castle's range. As the young Ballesteros hammers ball after ball over the boundary fence, the mind wanders back to his father Seve driving the 10th at the Belfry and other golden memories. The final years of the late five-time major winner's career were plagued by an inability to hit fairways with the big stick but the 24-year-old Javier confesses his driver is "the best club in my bag at the moment". It may be a grey, wet Wednesday in Ballymena but young Ballesteros insists he is enjoying a professional golf adventure that began last November. 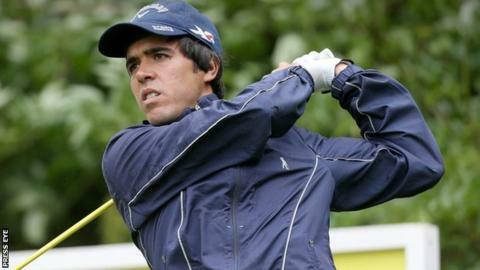 Academically very bright, Javier studied law for three years at one of Spain's top universities in Madrid and also had a stint at college in the US before he opted to join golf's paid ranks. "I'm very happy with what I'm doing. I'm having fun. "My dad always told me it was very important to have fun and also to work hard with your game." Javier's junior career did not necessarily mark him out as someone who was guaranteed to enter the paid ranks although he did achieve a notable victory at the Madrid Amateur Open event in 2012. However, Javier insists that turning pro was always part of his plan and that his late father offered him full support in that endeavour before his death in 2011. The 24-year-old's European Tour debut at the Dubai Desert Classic in January was not a particularly auspicious beginning as he exited early after rounds of 83 and 81 but there have been signs in recent Challenge Tour events that Javier has genuine ability. Ballesteros achieved a top-20 finish at the Challenge Tour's Najeti Open in Northern France, which would have been even better but for a slightly faltering finish on the last day. "When I finished I wasn't that happy because I felt I could have got a top-10 because on the last day I missed a putt for birdie on the 15th, then three-putted the 16th before bogeying the last," recalls Javier, who will play in Stage 1 of the European Tour School in France next month. "Those three shots would have put me in the top 10 but a few days after the event, I realised I should be happy with my performance." Ballesteros comes into this week's Northern Ireland Open European Challenge Tour event having missed the cut at last weekend's Madeira Islands Open co-sanctioned tournament. However, the Pedrena man insists that he is happy with how his game is progressing and following a look around the Galgorm Castle course, his initial thoughts about his prospects this week appear positive. "It's a very, very nice course. Yesterday I only planned to play nine holes but I was enjoying the course so much that I decided to play 18. "It's not an easy course. Yesterday it was playing quite tough because of the wind but the greens are so good so I'm very, very happy with the course." Like his father before him, Javier's natural inclination on the golf course is to attack and he admits that he is battling to rein in that tendency. "I usually make a lot of birdies but this year I am making lots of sevens, triple bogeys, quadruple bogeys. "In Switzerland, I shot one under the first day and then four over the second day when I had a seven on a par three and a seven on a par five. It's difficult to score with that in amateur golf, never mind pro golf. "It usually happens to me because I go pretty much for every flag but I'm working on that and sometimes just going for the middle of the green and making a par." But while his desire for the daring cut at the green or escape from the woods matches his father's philosophy, Javier insists his famous golfing name is not a burden. "Not at all. People are always giving me this question. Being [a] Ballesteros can only help me. "What my dad did…you never say it's impossible [to achieve] but I cannot compare myself to my dad. "When he taught me and we were on the driving range or playing, he always told me to work really hard and have fun. "I'm very happy when someone tells me of their happy memories of my father - like you did today - but I try to be myself and I promise you I don't feel any pressure." By the same token, he is aware that people of a certain longevity will be enticed along to Galgorm this week to see the son of somebody that they adored, even though many of them only saw him on their TV screens. "If people come to the tournament or come to see me. I'm happy with that."